Lili Francus and Lilianne Milgrom’s art of collage "Espirit de France" will be on display in Western’s Art Gallery. Western Wyoming Community College will display collage works by award-winning artists, Lili Francuz and Lilianne Milgrom, in the Art Gallery from October 12th through November 16th, 2018. Espirit de France (The spirit of France) is a show of the art of collage from Lili Francuz and Lilianne Milgrom. The original intent and meaning of the term “collage” at its inception, around 1907 in France, was to cut and paste. Collage has come to include montage – a collection of photos and assemblage a collage of 3D objects. It is a way of thinking within art making exemplified by the very different approaches of Lili Francuz and Lilianne Milgrom, according to Professor of Art at Western, Florence McEwin. The work of Lili Francuz initiates in an un-premeditative manner as a response to color, pattern, and texture, while the work of Lilianne Milgrom is inspired by imagery. Both approaches ultimately provide narration of the viewers’ making. 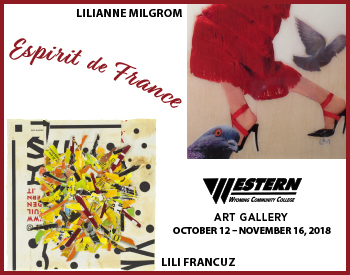 Lilianne Milgrom is a citizen of both the USA and France and Lili Francuz began her formative years in France. There is an inherent muse that has emerged from their individual backgrounds and hence the title of the show, Espirit de France. The exhibit is free and open to the public. The community is encouraged to attend. For more information please contact Dr. Florence McEwin, Professor of Art, and Gallery Director at Western, via FMcEwin@westernwyoming.edu.